Most modern technology works electronically by making electrons do the things we want them to do on semiconductors. All electronic semiconductor circuits work on the basic idea that any given electrons can influence the control of other electrons and holes adjacent to those electrons. This implies that we can use one current to control another in a specific way we want to engineer. That is what a transitor gave mankind in the technology revolution. What happened 600 million years ago was biology’s Big bang and lead to a technology revolution by changing a bacteria into a mitochondria that could reverse the photosynthetic process. What was the stimulus to this change? I believe incident light was the stimulus that lead to this change. I think this new release of UV light from the sun was slowed down by parts of the cell that led to structural change of things with mass inside the cytoplasm. Our class star is expected to undergo this frequency change in midlife. 600 million years ago the sun was in this mid life time span. UV light spiked and made the surface skin of the planet more transparent to sunlight. This had a massive impact on the planet’s life forms. At the time solar power was raised some other things occured on the surface of Earth. 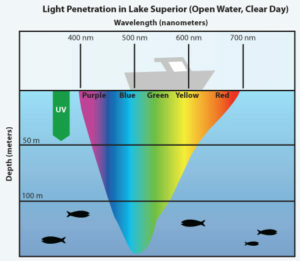 More UV light penetration meant more oxygen would be liberated in the atmosphere from ozone and in the seas photosynthesis was super charged to make both DHA and oxygen at the same time in the seas. Most people wrongly assume the Earth is a water filled planet but that is a big misnomer. Earth is an oxymoron. It is an ocean planet that is bone dry. The oceans have an average depth of 4 kilometers and they hold enough water to fill a sphere more than 1300 kilometers across. That is it. 2/3 of Earth is covered by water from a space view, but many people are surprised to find out that all of this water only forms 0.02 % of the mass of Earth. For analogy purposes, if our planet was a 300,000 kilogram Boeing 777, then all the ocean water’s mass would equal would be the mass of one passenger on this plane. That is how rare water really is on Earth. What fools us to this reality is the location of water. It is on the surface where we can perceive it, giving us the facade that water is abundant. It is not. But its location is the key to why Earth can foster life using sunlight. Water forms our skin on this planets’ microbiome. Freshwater is mainly locked up in the polar icecaps, clouds, lakes, soils, and the Earth’s biota only makes up a tiny fraction of this total. That is how rare your water supply is. And, it is one of our key legs in the stool of life. This is a key part in the biologic semiconductor life uses to innovate by a quantum evolution. Because of the change in intensity of light several major breakthroughs occurred during the Cambrian explosion. This allowed organisms to acquired the ability to use vision. To see you need the seas to be more transparent to sunlight. As DHA spiked this allowed for the massive evolution of the eye to occur. Prior to this event almost all the fossils we have show that nothing had an eye. As DHA and eyes showed up so did oxygen both in the sea and in the air. This gave evolution its first chance to utilize molecular oxygen. Why was this a huge advantage? Among other things, this enabled the aerobic catabolism of foods via oxidative cellular metabolism in mitochondria, which produces far greater amounts of energy than can be obtained anaerobically. 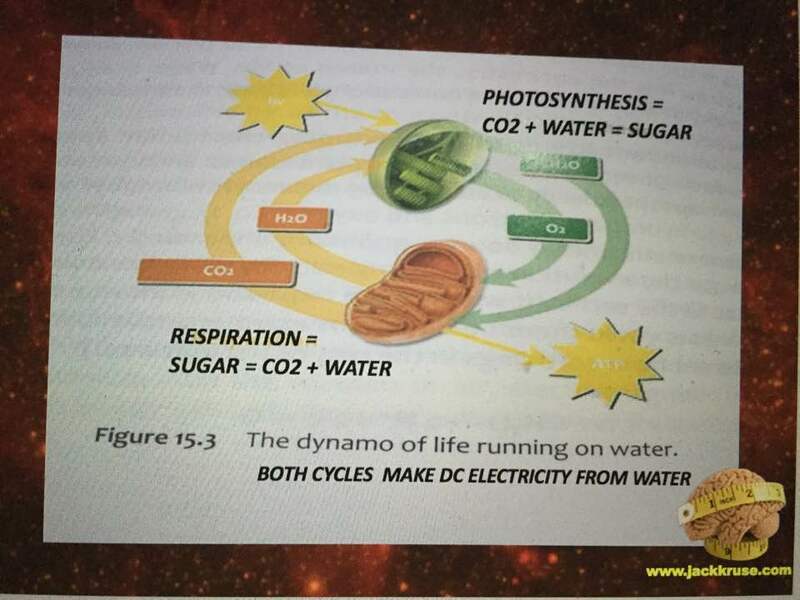 We need to remember that foodstuff electrons get feed into mitochondria and the results are that mitochondria make CO2 and water in the cytoplasm. Over millions of years of quantum evolution on the surface of Earth, this led to rapid speciation and complexity that we saw at the Cambrian explosion. 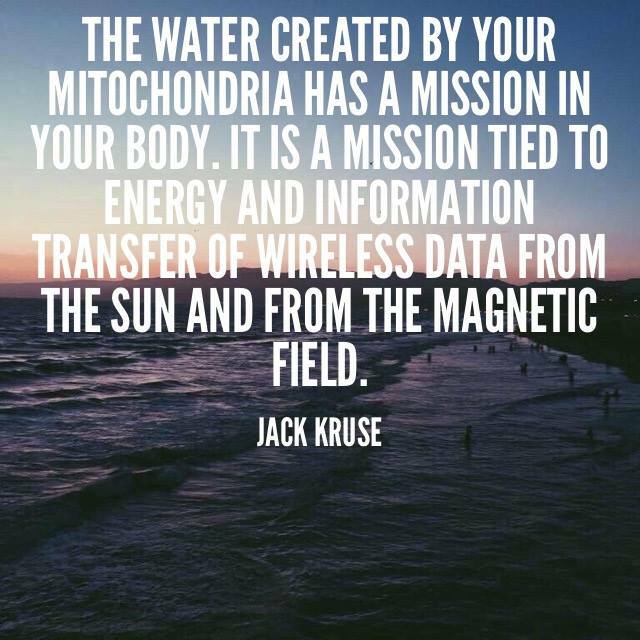 Eukaryotes figured out how to use mitochondria inside a cell to create a sea of water inside of cells for the very first time. These radical environmental changes allowed for predation in the food webs to gets excited electrons from foods. The sun is what excites and programs these electrons with information the mitochondria needs to decipher the chaos present in the environment. Prior to the Cambrian explosion all things got the energy via photosynthesis and predation or eating was not really needed to live on Earth. Sunlight creates a huge redox pile of electrons formed in cell water made by mitochondria. Plants major proteins are not as hydrophilic as the collagen back bone as animal cells. That difference is seen in the amount of electrons made to run redox reactions in cells. The collagen-water tensegrity network in animals cells allowed for a larger source of energy to build complexity in the animal phylla after the Cambrain explosion because of the change in the physics of cells in organisms. 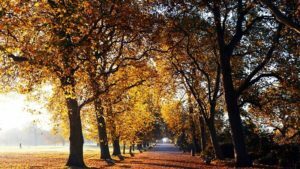 This increase of electrons allowed for more rapid animal version or photosynthesis in their blood and bodies plans using phosphorus to split sunlight into hydrogen and oxygen in their blood. It also set up the plan for endosymbiosis. All these things set up for a rapidly accelerating rate of evolution from this time period. Quickly humans have evidence that increasingly complex animal and plant life forms colonized the planet, culminating in the first appearance of mammals about 200 million years ago. With more environmental pressures they later rose to become top mammalian species after the dinosaur extinction around 65 million years ago. Our sun is a certain class of star and is considered middle aged. When these stars are at this stage of life they undergo a phase transition and begin to get brighter due to more UV light release. 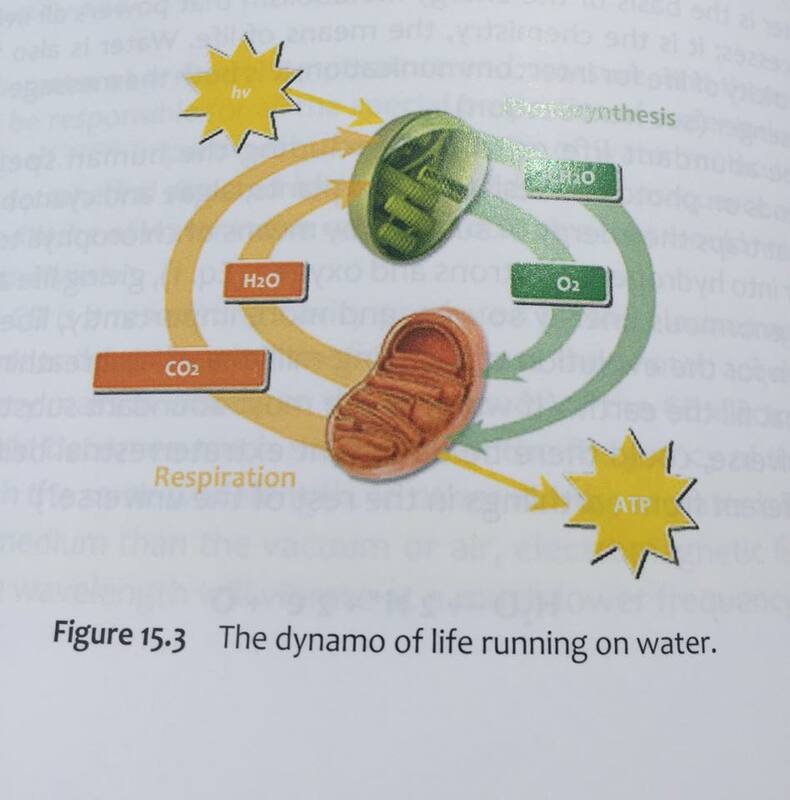 So, solar intensity stimulated the oxygen spike that is common in modern eukaryotic life. If you take away the sun, you effectively lower oxygen production by plants and bacteria and by ozone in the atmosphere. Our mitochondrial becomes pseudohypoxic and as a result NAD+ falls at cytochrome 1. This changes the free radical repsonse and cause a higher heteroplasmy rate in mitochondria. This lowers the redox potential inside cells and across the inner mitochondrial membrane. This lowers the delta psi in mitochondria and affects the adenine nucleotide transporter (ANT1) resulting is less ATP production while also slowing the spinning head of the ATPase. This created a need for a new source of electrons from a developing food web. That web was provided by the photosynthetic pathways. 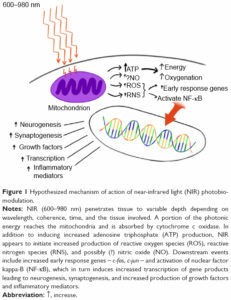 This is why photosynetheis and oxidative phosphylation in mitochondria are linked by sunlight. Both create electricity from water in a reversible process. As mammals became more specialized they relied heavily on their blood’s ability to make energy from phosphorus laden proteins and from their mitochondria. Anything that lowers the quantum yield of sunlight directly affects blood chemisty and the terminal electron acceptor in mitochondria. It is akin to pulling the plug out of the wall of an electric device. Animals are photoelectric devices that need both the sun and oxygen to maintain their quantum computers. If we take away sunlight and oxygen organisms cannot produce enough energy to support their more complex designs, and they begin to fail, go extinct and de-evolve to match the complexity that the incident energy sources will allow. This is how I view Zika and all neurodegeneration today. 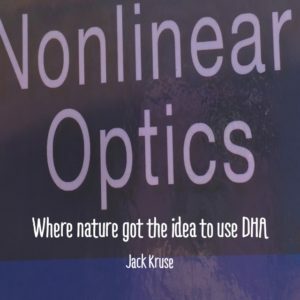 What non linear optics does is set up the conditions where photons can be made to do what electrons are doing today for mankind. The key to using light in this way is the materials that we choose to operate this system. Technology is struggling with that material bottleneck today but Mother Nature perfected it in our tissues by using carbon and water for her main semiconductors. Both of these materials give the matter of life a huge advantage. Carbon forms many organic polymers and water is capable of doubling its dielectric constant when it absorb light. This gives both material an unusual electric susceptibilities. Water, in particular has some unique features. Since the water molecule is dipolar, its electric field is unbalanced. Because of this water molecules tend to rotate and align with the lines of an electric force. Since collagen is a polymer of carbon and it is piezoelectric, and water always hydrates it, collagen can help align water into a polymer like EZ structure that contains coherent domains in it. Only 13% of the EZ of water forms these coherent domains (CD) that Del Giudice and Preparta found 20 years ago in their research. The CD portion of the EZ allows water to capture electromagnetic waves from the environment, pump it into cells where they store it and amplify it, to produce coherent bio-photon field in the living state. The light cells liberates from this coherent light source is capable of generating excitation of the liquid crystalline substance of living tissues with in frequencies that are found in the external electromagnetic fields a cell stores. In the cases of things with chloroplasts and mitochondria that source is sunlight. In fact, the closer two wet surfaces are to one another the harder they are to move apart. This attraction is not linear and it requires no energy input to maintain. This is why water is always oriented by the electrical gradient in collagen to structure into an EZ with a strong dynamic coherent domain embedded in it. 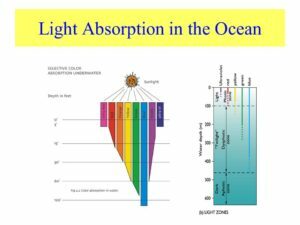 All biologic molecules have their own individual spectrum of vibrational frequencies of absortion and emission. When the molecule’s spectrum is frequency matched to the environmentally built CD in EZ water, it becomes attracted to the CD and become a guest participant of the liquid crystal. This allows it to share in the excited CD coherent oscillations. This excited CD then can share its energy with the molecule to excite it. This is what provides the activation energy for all bio-chemical reactions. ATP does not do this. The CD of the EZ is the key to explaining enzymatic flux in living cells. It is built by water electricity from the collision of sunlight and cell water. This frequency matching allows coupling of sequential reactions in biochemical pathways because new products of these reactions would have a different vibrational spectrum than the reactants. This gives the cell a way to control biochemical pathways using the coherent bio-photon fields in the CD of EZ water. This also helps explain the findings of Luc Montagnier’s work published recently in nature on the “memory of water”. The coherent bio-photon field that Popp and Gurwitsch found in their work becomes the controlling lever of all biochemical pathways in cells and the light frequencies can make them run forward or backward. These ideas all imply that cells and organism as a whole structure are fully capable of intercommunication by means of electromagnetic and electric signal generation from their liquid crystalline state. This state is build by sunlight and cell water when that cell water is adjacent to collagen. It also means that very little solar light stimulus is needed to build this state as a stimulus. This tells us why in biology that in order for any adaptation to occur, the stimulus must resonate at a specific frequency to gain control of a particular reaction in a cell. In the neocortex that stimulus in the bio-photon field must be at 40Hz. In a mitochondria it must be at 100 Hz to fat burn via beta oxidation. If the stimulus vibration is off, the physiologic ability vanishes and the traits and phenotypes in the living thing will vary. No amount of fuel changing will change the physics of the coherent domains in the exclusion zone of water. Bulk water is a dipole, and dipoles have to remain with a neutral charge. Water becomes a liquid crystal when sunlight hits it. Crystals are capable of non linear functions. Liquid crystals really elevate the ability to use certain non linar processes like second harmonic generation (SHG). SHG in collagen is exciting science. In the 1970’s G.H. Bardelmeyer found this electric ability in achilles tendons of animals. He found the ability was tied to free proton water electricity generated from water and light. This is why Achilles tears are always a sign of poor connections to the sun and Earth at some level. His results make sense in the recent observations made in experiments that proton superconduction occurs in nanospace confined water below 1.6 nm. Water at this scale does not act like modern fluid flow dynamics believes. I cover this in the May 2017 webinar for the skeptics. The important discovery of superfast quantum tunneling in chiral water polymers was key. Collagen is also chiral. Around chiral collagen, water hydrates surrounds this molecule, and you can see how the body plan is built in animals and can be 100% light activated and controlled. Since quantum tunneling occurs in the chiral water collagen nanotubes in cells it implies that cells have the ability have almost instantaneous communication between cells and tissues throughout the body that exceeds the speed of light. This explains why living things seem to do things they should not be able to do. They are quantized from top to bottom. 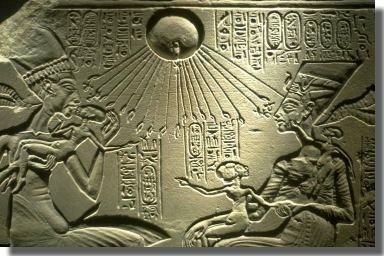 SHG is one of the key non linear pathways life uses that dates back to when the sun’s light intensity got more bright. Bright light is a key physical requirement for all non linear optical effects. SHG in water and collagen allows cells to combine photons from the suninteracting with the coherent domain in EZ on the surfaces of collagen to form new photons with TWICE the energy and therefore has double the frequency while having half the wavelength. This is how a cell crreates a coherent light bio-photon field. This is the field Popp and Gurwitsch found and it is detailed in Van Wijk’s “Light in Shaping Life”. SHG in collagen is 100% dependent upon the hydration status of a cell. 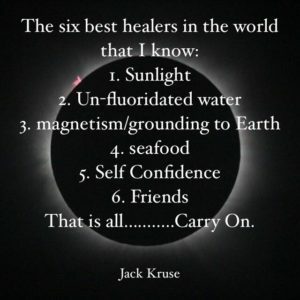 Man made blue light and all nnEMF cause intracellular dehydration, and this is why they directly alter the bio-photon release in eukaryotic cells to cause mitochondrial diseases that change the vibrations of things inside a cell. That is why the Warburg redox shift really occurs in many diseases. The effective thickness of the SHG shell is strongly dependent upon the ionic strength of the surrounding solution. Increasing the ionic stength decreases the the SHG shell and limits the bio-photon field. I figured this out from 12 years of mito-hacks done on myself. The Quantlet was built around these ideas. To my knowledge no one has figured out yet how the human bio-photon field is built until I wrote this blog ten years ago. Now I share it with you and the world. I have no idea if my intuition is right……..but I would not bet against me. I believe today that metabolic/energy regulation depends fully on the flow of protons put in motion in the liquid crystals in us at nano spaces in out extracellular matrix. The stimulus to proton movement is sunlight. Sunlight can make electricity from water. We make both electron electricity and proton electricity and the proton electric current is easy to make…………….Polllack’s work on the exclusion zone was the last bit of proof I needed for my thesis. Why? Protons are excluded from water when sunlight hits it and that delocatizes these free protons and they can move. These free protons are what activates all enzymes. Jim Al Khalili has shown this in his work in bio-physics. It all makes sense when you put it all together. Sun light hitting water on collagen creates a template that is liquid crystalline and quantum coherent that can be used to make a bio-photon field that can be powered to control all biochemical reactions. It also makes postive and negative electric currents that work in cells to power things locally and and globally. That idea defines quantum coherence. Collagen, DNA, and DHA really use SHG to make the living state a reality. That is why this blog is called Reality 11. This removes its dipole characteristic and allows exclusion zone water to build a large net negative charge. Sunlight changes bulk water so it takes on the look of ice structures which can be thought of as a polymer of water. In ice, water crystals are arranged in hexagonal shapes to create a honeycomb pattern. In the exclusion zone state of water, protons are excluded, so the protons in one layer of water that bond to oxygen in an adjacent layer is no longer possible and this will not allow an ice like rigid structure, but it does allow a liquid crystalline state to manifest. This is why liquid EZ is a fluid because it cannot have a rigid structure. This fact about water should make you think back to the last chapter of my first book now, The Epi-paleo Rx. The polar ice caps were the key to life returning on land and in the sea. Since ice has no net negative charge, it means that it cannot be affected by the electromagnetic force from the sun. This force only deals with charged molecules and atoms. This makes ice an ultimate Faraday cage for the spectrum of light too. Does life use this during extinction events to protect the liquid crystalline state so it can bounce back when the collisions of sun and water can resume? I think so. This is why the cold seas could have protected life to mitigate phase transitions of energy in previous extinction events. The net negative charge of the EZ rebuilds the coherent domain sizes in cells and allows for cells to become disturbed and awakened by light when it returns and the electromagnetic force can resume the process of survival. This is how many animals survived a low quantum yield environment after the KT event when photosynthesis was disrupted for some time. 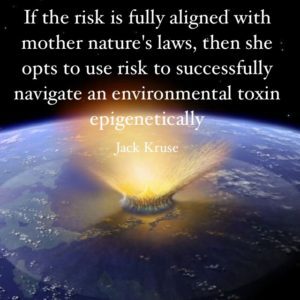 How does life respond to extinction events? It re-establishes the quantum coherent bio-photon field to maximize both local freedom and global cohesion. How could we have local autonomy and be able to transfer energy rapidly from the local to global parts of the biosphere and vice versa during these events? Frequency matching of sunlight to biologic rhythms can do it. We now know that all biologic circadian rhythms are irritional multiples of one another under the steady state normally found on Earth. Those conditions are destroyed in extinction events. What is the molecule in humans that provide local autonomy and imparts a global control? MELATONIN. How so? In the Time series I told you that melatonin controls mitochondria DNA dynamics and all energy flow in a mitochondria. Mitochondria is globally distributed in humans and they are all linked to by a 100Hz oscillation by the IMJ’s in mitochondria. Researchers in Dr. Wallace’s lab found this amazing link. Melatonin locally controls the heteroplasmy rate between the respiratory proteins and that rate causes a vibration to develop. That vibration can be frequency matched by the bio-photon field created by sunlight if sun light is present in buiding the coherent bio-photon field in our liquid crystalline state. Sunlight creates electric susceptibility in water because light carries an electric and a magentic field as it travels from the sun to Earth. Bulk water has a dielectric constant of 78. EZ water has a dielectric constant of 160 and I believe that number is 100% linked to the CD portion of the EZ. Pollack’s books have not laid these facts out well enough but Del Guidice and Preparta work has. They extended the boundaries of QED theory of condensed matter physics of liquid crystals with their findings in water. Electric susceptibility is a dimensionless constant that indicates the degree of polarization that is possible of a dielectric material in response to an applied electric field. the degree of polarization tells us about how much the Faraday effect can lead to electric susceptibilities. Tissues respond both in linear and non linear ways but what the material is made out of explains what kind of optics are possible. First order susceptibilities lead to linear optical effects many of you have heard of. Those effects are refraction, absorption, and diffraction of waves and are all governed by first order electrical susceptibility in tissues. Intensity dependent refractive index (IDRI) Number 9 and 10 govern the working of all photonic switching devices known to science. Polarization also has a time domain associated with it and this is likely why circadian biology was one of the earliest evolved programs in living things. It is also why the 40 Hz frequency in the neocortex is critical to human brain function. It also explains why all the rhytms seen in the human EEG operate via the Fibronnaci sequence which is based upon and irritional number and this ties it to an irrational integer (phi: the golden ratio) that our brain uses to couple cycles that can exchange energy by molecular resonance. This is why circadian biology is the primary way we rebuild wellness. When we are dealing with linear optics and simple polarization effects, it only depends upon the local electric field in question. The problem in understanding what biology is up to, is that life is never lived within a constant local electric field source because the sun’s light frequencies create a dynamic electric field over the course of a day in any location on the planet. This means that the cell in each tissues has to have a way to measure this interaction and that “measurement” becomes very key in understanding life. The mathematics of non linear optics tell us that the initial polarization affect on any medium where it is glass or cells, has to affect future polarizations. Light naturally sprials into out eye and skin giving the cells of our body more information about light. Sunlight is unpolarized. Man’s light is polarized. 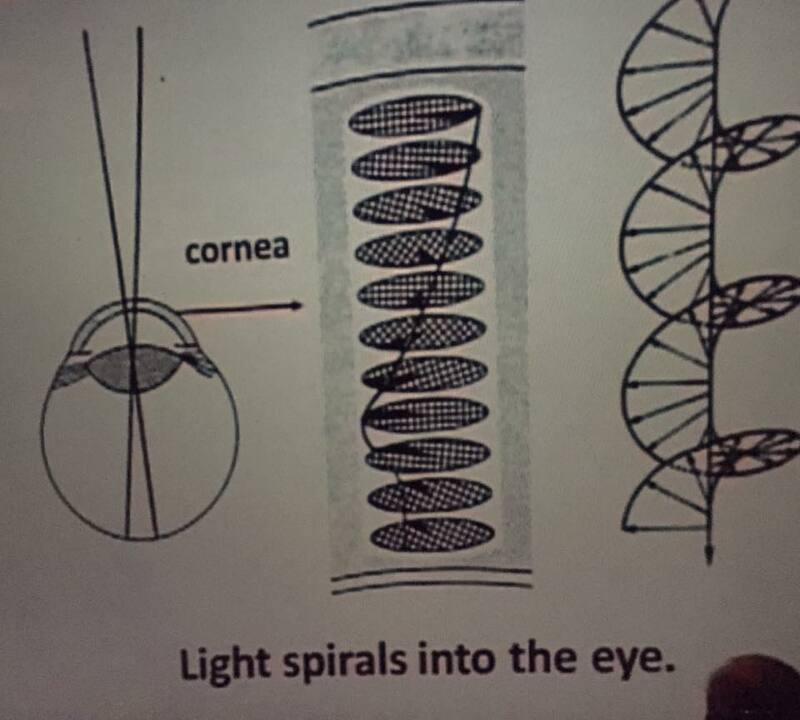 This affects the spin of light spins in our eye’s and skin. The spin is fully capable of alter circadian cycles. Here again you can begin to understand why light is critical in circadian timing with respect to the optics of light. These time domain circadian responses then can lead to frequency domain responses in tissues. This explains why every gene in every cell has a peripheral clock gene in front of it. They are constantly measuring the environment when our eyes and skin are entangled with it. Macroscopic systems, like living things, are never truly isolated from their environments. Therefore, they should not be expected to follow Schroedinger’s equation, which is applicable only to a closed system according to quantum mechanics principles. The interactions between sunlight and our tissues during daytime are what creates the connection between the small quantum world and the larger macroscopic world we observe. Night time allows for the disconnection or decoherence from between the quantum and classic worlds. This is why day/night signals are mission critical for life. It is at this “transition zone” between classical and quantum worlds, where energy and information transfer can create interesting phenomena that we call life. As a result of this set of circumstances, living systems are usually regarded as classical, and they suffer or benefit from the natural loss of quantum coherence, which “leaks out” into the environment because the environment is capable of measuring the electrons, protons, and photons. WHERE DOES THE DC ELECTRIC CURRENT COME FROM? CD’s in water adjacent to DHA. I won’t discuss each one of these non linear aspects of light in this blog but I will highlight the ones that biology makes the most use of. Optical rectificifation is a second order process in which no light wave is emitted from the process. Here incident light becomes electricity. DHA uses this non linear process in cell membranes to create electricity from water. The result of this process is “merely” the development of a DC polarization in tissues. It supports the bio-photon field that is emitted from every eukaryotic cell. This is why DHA changed evolutionary history in cells at the Cambrian explosion. It also explains where the DC electric current comes from in the perineural tissues described by Becker. It also explaines why the DC current is present in daylight conditions only and absent at night. Does this mean time is relative to day and night cycles? Yes it does. Time is relative to how our tissues store energy to maplify it to make the coherent bio-photon field. Since and time is relative, it means it can pass more slowly depending upon your state of motion. That motion is tied to your tunneling speeds on your inner mitochondrial membrane. The closer the tunneling speeds are to the speed of light at night the longer you will live because as one approaches the speed of light, time begins to pass more slowly. This is what time dilation is. Tunneling speeds in mitochondria are fundamentally tied to the distance in angstroms between your respiratory proteins. This is controlled locally by melatonin cycle, your mitochondrial DNA, and your % heteroplasmy. Your % heteroplasmy rate is a linear relationship to the amount of coherence in your tissues. This is a function of how much energy can be stored in your cells to keep your body far from equilibrium. This makes living things a system of computational device that uses light at night and electrons and protons during the day to do its accounting work. The relative speed differences of light outside our cells and our organelles both inside of our tissues is what creates time to manifest. Time moves more slowly when out cells are connected to sunlight, geomagnetic pulsations and the lunar cycles. All of these waveforms are connected by a molecular resonance to circadian and ultradian cycles in cells. Cycles are how we couple chemical reactions perfectly so that no waste occurs by frquency matching in light cycles. This favors the living state and it does not allow cells to fall to an equilibrium state. When we use light at night to signal, since light is incapable of interfering with other light rays being sent to and fro, it creates the chance to build a quantum computers buried in hydrated molecular machines in the organelles of cells and tissues that gain the ability to make trillions of connections that simply pass through one another going from place to place carrying information and energy. How is the light transformed or transmuted into things we can use like matter? Light can only be confined by electric and magnetic fields in media like stars and living tissues. What affect controls this? In cells this electric and magnetic ability is called the Faraday effect, and it the key to understanding how living things can hit “warp speed” during night time. If we can retain light speed by altering the space and time ain and around cells, we can gain time back via time dilation. The Faraday effect gives cells this ability because it generates massive magnetic fields. The stronger the light wave the shorter its frequency its and this puts us intot the UV range in the visible spectrum. This begins to make sense why all cells release ELF-UV for signaling at night. The reason is simple, the shorter the wavelength of light, the higher the magnetic field it can generate when propagating through a medium. Note, this is not true in a vacuum. However, a peculiarity of the effect is that it requires absorption by a medium for its very existence to occur. This is why a cell is made of a liquid crystal of water and collagen. It is designed to interact with the sun’s visible spectrum in a predictable non linear way. Hence you can see why life would use this non linear effect at night time when cells opaque and have already absorbed the light during the day time and stored it in the tensegrity system, EZ, and in cell membranes. Why doesn’t this effect occur in the day time in living things? Recent research has shown this effect does not occur in entirely transparent media. Cells are transparent to light during daytime and this is what lights the fuse to the generation of huge magnetic flux in tissues at night. 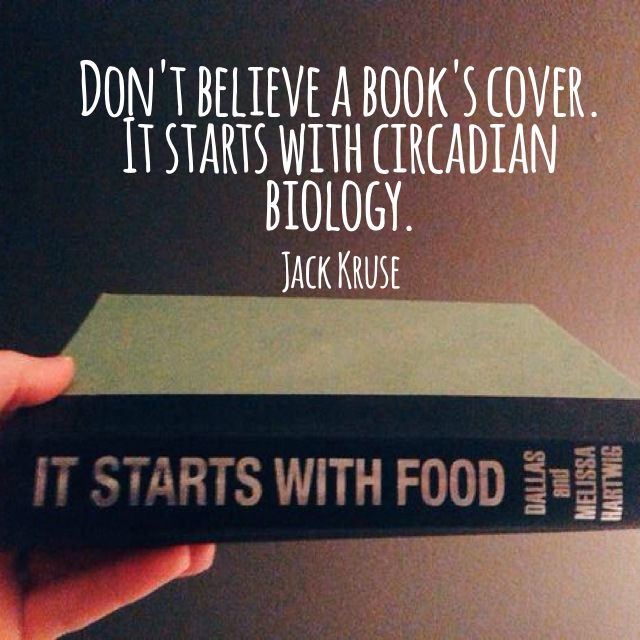 This explains why circadian biology trumps food at every level. The Pockels effect occurs in the presence of a DC electrostatic field that develops in tissues during daytime when the DC electric is measurable in cells. This effect goes away at night time. cubic : this crystal has the most optical symmetry. All of known crystal systems come under one of these mentioned above. Crystals are capable of become fractals of self similarity. This is why nature is built on a fractal skelton. The intrinsic symmetry is directly linked to its thermodynamic properties. This is why light links to thermodynamics and why size and shape link to geometry and why geomtery links to the vibrational state of the liquid crystals in cells. Many scientists have believed that life somehow skirts the second law of thermodynamics, but it does not. It uses water as its main liquid quasicrystal to increase the ledge of the second law so life can dance upon its edge. It always obeys it but it uses non linear optics to defy biologic and classic physical expectations. This is why dogmatic biologists and physicists to this day are flummoxed that as time increases in life it appears to move further from equillibirum and embraces entropy and randomness. This is why life appears to break the second law, but does it really? They key to understanding life is based in understand how optics allow it to stay far from equillibrium using the processes in this blog as back bones of the design of cells in living things. Life is only found at equillibrium at death. The reason life appears to skirt the second law is that non linear processes in light make the ledge of the second law massive for living things to operate using light’s non linear abilities fully……..so this allows cells a huge plateau to dance upon. This is why life exists. Humans have built their computers out of silicon and electrons. Nature appears to have chosen a different pathway using light, electrons, and protons. What would happen if we could replace electrons with light and carbon for silicon? The answer is simple…………Life becomes possible. 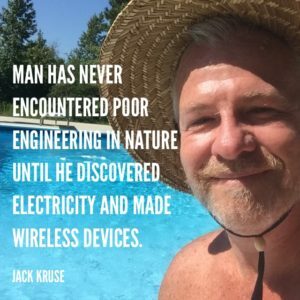 Life is the computer system that nature built to evolve using light and not electronics. This moved computation from electronics to photonics. When you change the fundamental parts of the “computational machine” some very big changes should be expected to occur. Electrons and photons are very different types of quatum particles. Electrons have mass, and photons don’t. electrons have a negative charge and photons have no charge. Both are quantum particles so that mean both are wavelike and anything that is wave like can be used for the essential job of of carrying a signal and an energy density. Building a light based quantum computer presents man many practical challenges but if they were wise they’d start examining biology more closely. Life is filled with light based computers. Using light to build computers offers one huge advantage from an engineering standpoint. Electrons repel each other and come from a family called fermions and they are a family that must obey the Pauli exclusion principle. This principle is a quantum mechanical law that states that no two electrons can be in the exact same state. Light, on the other, comes from a different family called bosons. And bosons are a family that have particles that love to come together and congrete. This is why Pollack’s like likes like idea fundamentally exists in his book. I don’t even think he realizes that. Since light is a boson it means that light photons can pass through one another and they can occupy the same areas and regions without penalty. This makes a computer based upon light and not electrons, with the chance to have the ability to make trillions of connections that simply pass through one another going from place to place carrying information and energy. That is what your brain is and its light frequencies are coupled by the golden ratio to oscillate the neocortex at 40Hz on 20 volts. SO HOW DOES TECHNOLOGY AND LIFE MEET IN A GRAND SYNTHESIS? Allan Turing had a lesson for us after he gave mankind the universal model of computation and proving his incompleteness theorem at Princeton in 1936-38. The Turing machine was showed us computation is a function of how atoms and their parts work. Turing described a perpetual motion machine. Science rejects this idea because of the second law of thermodynamics but they need to realize that nature’s definition of perpetual is tied to a life and death cycle, where life is rarely extinguished. Science tells us that perpetual motion machines are impossible, because perpetual motions are impossible, except at the level of quantum particles, which can never truly stop moving. If this sounds a lot like what occurs on the inner mitochondrial membrane to you, you should smile about now. You’re beginning to see why nature reversed engineered a bacteria to build an energy power house that uses electrons, protons, and light as its key components. This gives cells the ability to pass on quantum vibrations indefinitely from one generation to the other creating a string of perpetual life we call evolution. Nature, made Turing’s perpetual motion machine out of things that are key in making it work for life. Ampere told us that two parallel wires carrying currents traveling in the same direction attract one another whereas when the same wires carry currents running in opposite directions they repel one another. This explains why a cristae in a mitochondria looks as it does under a microscope. In the 1830’s Faraday discovered electromagnetic induction. This showed man how he could induce an electric current to flow in a coil of wire by moving a magnet inside. This is why DNA is highly coiled and why its structure has atomic magnets built into it. If you stop the motion of the magnet (think ATPase now), the current in the wire disappears. This is precisely how Tesla figured out how to generate electricity in power stations in the late 19th century. Today we use coal or falling water at hydroelectric plants to drive the motions of magnets relative to the coils of wire. In a mitochondria we use sunlight, and its inherent frequencies of light to move the magnets in ourDNA and mitochondria to do the same thing. But modern biology does not understand physics well enough to see how these old ideas are put to evolutionary design principles in mitochondria or nucleic acids. So you might be wondering what are the magnets in DNA? The base pairs of DNA are those magnets. The enzymes that control DNA expression are heavily influenced by paramagnetic calcium and magnesium. 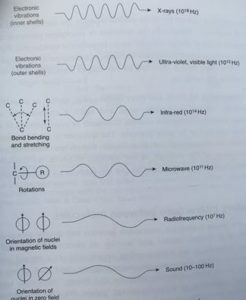 Paramagnetic atoms are drawn to magnetic fields. If you look at an axial view of DNA below you will notice that phosphorus sticks out from the helix and they atoms lie next to water when it is uncoiled. When phosphorus is hit by light, it charge separates the surrounding water, and is the stimulus to simulate the first step in photosynthesis seen in chloroplasts. Animals found 50 million years after chloroplast were made that phosphorus could charge separate water as well. This is why animal tissues are loaded with phosporus intermediates in the energy generating pathways. Phosphporus and mitochondria are more efficient system to make energy from the sunlight to create greater complexity that we saw in plants. Plants provided molecular oxygen to fuel this change in energy dynamics in animals 50 million years later. This creates molecular hydrogen and excitons that can be used as a clean fuel with an unending supply of energy to power DNA enzymes which use that hydrogen for proton tunneling when it is being expressed. C. Note the ten phosphorus groups sticking out to bind with EZ water as DNA unwinds. When DNA is uncoiled it is know to release massive amounts of light from bio-physical experiments. This is why excitons are formed. 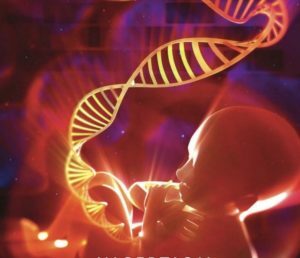 They are the keys to understanding how epigenetic expression works and right now we do not know enough to understand that process in total. We have not resolved what the spectral density of that light is coming from DNA or from cells, but I have a deep sense it is goinf to be UV density light. I believe this because I think non linear aspects of light will be used to make aromatic free radicals that can magnetize base pairs and atoms that DNA enzymes use to work at extreme speeds. I believe the UV light will also be found to magnetized paramagnetic and ferromagnetic substances to become induction motors inside of the nucleus. These induction motors can then electrify and magnetize DNA in specific ways depending upon the spectral density of light released that can leads to protein synthesis. The light interacts with the phosphorus on DNA outside can turn the surrounding water into a matrix of life. Water surrounds these phosphorus atoms. 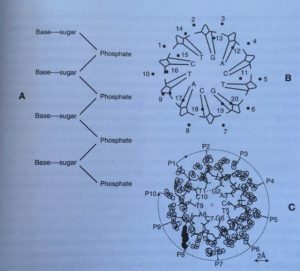 The exterior phosphate backbones face outside of the double helix, and this allows for massive amounts of charges to be clustered adjacent to water to activate it with light. This is the basis of Beneveitse and Montagnier water experiments, in my opinion. The light in this region is also capable of creating hydrogen because phosphorus and light can charge separate water into hydrogen which alters the adjacent hydrogen bonding water network. Water is half of the living machinery and it is not there around DNA just to fill space. The base pairs and phosphorus forms perpetual motion quantum nanomachine that forms one single operational system that cannot be reduced to be studied. If you separate this system into its components you will destroy their essence. Moreover, you will never understand how they operate. In this way, this perpetual life machine becomes able to imprint their spacial configurations and structure into water’s networks. A solid state perspective would say this is how life’s lithography process in making semiconductive chips essentially operates. Inside this “chip of life” water is tightly bound because it has a huge electric charge and water binds to surfaces with electrical charge. Just try to pry two wet glass slides apart if you doubt this. In fact the closer the two wet surfaces are the harder they are to separate. This is why water has a propensity to be oriented along an electrical gradient. This implies that uncoiled DNA/RNA requires very little energy to copy itself. If that sounds hard to believe I would have you look carefully at hemoglobin. It too shares this feature with DNA because of how it was designed in quantum fashion. Hemoglobin can form spontaneously in an aqueous solution too. In DNA it has been shown that its base pairs can become magnetized and generate massive electronic signals when they are deprotonated. The formation of EZ water can deprotonate the area around DNA to construct the EZ. It can do this easily because of how light naturally alters the hydrogen bonding networks in water. This quantum process can work just like an ionic plasma would with highly powered UV light. In 1981, Clementi used an IBM computer to study this process using a “molecular dynamic approach” and found that DNA is rarely in one conformation. He found it always moved and DNA’s various atoms within it can be viewed as clouds of electrons that are readily polarized by electric fields of nearby water and ions. In his paper, he said that DNA changes its structure 3,000,000 times per second. Anytime a water molecule or ion approached the base pairs the pi-electron cloud in that base pair was altered. This sounds very similar to how semiconductors work. This movement then affects the local electrical properties of the system and it recaluclates the next step millions of times of second. This sounds like what an exciton does in a leaf. On the outside of DNA sits ten phosphate groups that interact with 447 water molecules. These water molecules encapsulate the phosphate groups and form hydrogen bonded like antenna’s or filaments. They extend the length of the DNA helix. Water molecules inside the DNA helix are associated with the sugar units in the base pairs. It appears water is what stabilizes the DNA semiconductor in a cell. Water forms the communication network around DNA. To evaluate its ability to function as an information carrier we have to know how well water conducts electric and proton currents now. Conductivity depends upon two quantities. How many mobile units it has and what is their effective mobility? When sunlight hits phosphorus it makes a huge amount of hydrogen protons. So one condition is easily met for communication. In water, hydrogen protons are rare because they are immediately hydrated to H3O+. It turns out that H3O+ moves way faster than Na+ or K+ ions. The high mobility of protons arises in water networks because protons can be rapidly transferred along chains of hydrogen bonded water molecules. So the second ability is also met in water to be a communicator of electromagnetic information and energy. Proton motion is so efective in water that little or no actual movement really occurs because closely spaced protons in highly charged EZ undergo rapid proton tunneling allowing them to jump across hydrogen bonds at light speeds. Protons tunneling actually stabilized the hydrogen bond in water and in DNA. These proton cables in water imprint the the geometry on the water surface and this phenomena is now known to be particularly powerful when the molecule is part of a rigid 3-dimensional quasi crystalline surface. Water is liquid crystalline. Its ability to be a liquid crystal allows it to remain immune to the random motions that could disrupt the imprinted information. This gives water an ability for high fidelity communication across large segments of a cell, tissue, and complex organism. The N–N cross-linked structures between DNA base pairs acts as di-radicals. They likely to result from the interaction of UV light release from the uncoiling of DNA. This uncoiling acts to create a high linear energy transfer (LET) radiation mechanism in cells. Linear energy transfer (LET) is a term used in dosimetry for radiation experiments. It describes the action of radiation upon matter. You can see from the picture below that UV light allows for electronic transitions with electrons in things that make up cells. UV light is capable of ionizing matter in cells, to different degrees, based upon its frequency. UV light is also capable of magnetizing things that are paramagnetic and ferromagnetic in nature. Researchers have generated guanine (G), cytosine (C), adenine (A), and thymine (T) radicals in a lab just by removing one hydrogen atom from an N–H bond involved in the normal base pairing. The radical species formed are those that naturally result from one-electron oxidation of the bases followed by deprotonation. The majority of radical base pairs that have been found in experiments possess either an anti-ferromagnetic or ferromagnetic characteristics. This would allow UV light to have an effect in making the radical itself because all bases in DNA are aromatic and they absorb UV light well. Once the base is radicalized it then can be magnetized by other frequencies of light. The key to these motions in the base pairs of DNA is the movement of the generated magnetic field that can affect the atoms that are sensitive to magnetic fields or can become magnetized themselves. Did you know that UV light is capable of magnetizing atoms? This is another reason why all cells are built to selecte UV light for emission or release for optical signaling, in my opinion. 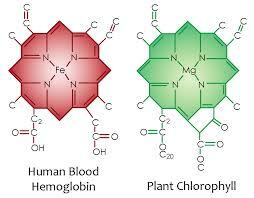 If you carefully look at hemoglobin and chlorophyl you’ll notice that a nitrogen cage, called a porphyrin cage surrounds a metal atom. In hemoglobin it is ferromagnetic iron and in chlorophyl is its paramagnetic magnesium. The nitrogen cages is important in generating many excitons in these molecules that travel to reactions centers at the speed of light using quantum mechanical laws of transfer. I have a sense the same arrangement is true in DNA and RNA. Why do I say this? In nucleic acids, there is four nitrogenous bases present in DNA: they are adenine (A), guanine (G), cytosine (C) and thymine (T). In RNA, the only differing nitrogenous base is uracil (U) (which replaces thymine in DNA and differs thymine only by the missing methyl group at carbon 5 of the pyrimidine ring). Of the nitrogenous bases, adenine and guanine are purines, which are aromatic compounds attached to an imidazole group, while cytosine and thymine and uracil compose a set of pyrimidines, which are one ring-aromatic compounds. All aromatic rings absorb all frequencies of UV light. Hemoglobin and chlorophyl are porphyrins proteins which also absorb all frequencies of UV light. The aromaticity of the nitrogenous bases accounts for the DNA absorbance peak at 260nm which is deep into the UV spectrum of light. In fact, 260nm light is the most highly powered light that has been found to fall to Earth from the sun. I don’t think this is a coincidence. The nitrogenous bases in DNA are naturally hydrophobic, so they tend to face inwards of the double helix, pointing away from the surrounding aqueous environment of the exclusion zone of water. The sugar portions of the bases however are hydrophillic and bind water in the center of the helix to form a strong cable of EZ that allows for proton tunneling. 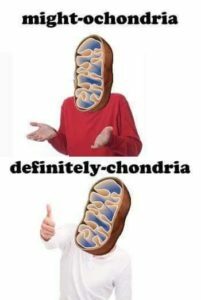 Not only does DNA/RNA work electromagnetically but so does your ATPase in mitochondria. I believe these two perpetual motion machines are linked together by water’s proton conduction cables so they work as a team. This is the key feature of mitonuclear coaptation. In 1865, we learned from Maxwell’s equations that all of them show how a time varying field, of either electric or magnetic flux, can induce a field of the other kind in the neighboring regions of space. This is exactly how sun light and the Earth stronger magnetic power at night built the circadian systems that control life. This tells us why “quantum time” (EMF 6) is critical for making life from biotic atoms programmed by light from abiotic atoms. How they work with light is the distinguishing feature. It also points out why circadian timing is primordial to life and to health. Maxwell’s equations taught humans that a time varying electric and magnetic waves don’t even require a living thing to move (trees), because these waves of light can travel through free space at the speed of light. From Turing’s work in the 1930’s to 1965, Gordon Moore gave mankind the the law of how integrated circuits can move electrons around silicon semiconductors. This law of technology tell us how electrons can be confined and moved on circuits built on silicon. It told engineers how they would operate and how its ability could double every 18-24 months to increase power. But what modern physics predicted is that with electrons and semiconductors there is a law of dimishing returns. There comes a point where this Law of Moore breaks down because you cannot fit anymore chips on a disc. This point is reached when the connections on a chip are down to the size of an atom and this leaves no room for further miniaturization. Since electrons are fundamental quantum particles, they become increasingly likely to escape their restructed movement in these integrated circuits as they move on the silcon chips. One way to escape this fate, and regain control of the electron, is to restrict electron movements from 2 dimensional chips to a 3 dimensional chip design. When this is engineered in a fab, you soon find out that this path has some serious collateral damage for energy, power, and processing speed. Right now silcon valley is stuck in this rift as we speak. They are now pouring billions of dollars into using “graphene” as the new material for semiconductive chips. It has some major benefits. Graphene is made of carbon atoms with a geometric atom thin specific arrangement that gives it unbelievable properties. It is 200 times stronger than structural steel, is super lightweight, and it can be made transparent to light. It also happens to conduct electricity better than any metal on the periodic table of elements. When you consider this, you begin to see why Mother Nature chose to make life’s quantum computer’s out of carbon based semiconductors. The one major problem with graphene is it is difficult to swithc off the flow of electricity. Samsung has developed a way to do it in 2012, but I have been showing you in blog after blog how life has been doing it for 600 million years using carbon based semiconductors made up of collagen, water, and sunlight. The fact that electronic computing is headed toward carbon based computing today give me hope. It means that soon physics will see the same design in living things and begin to realize why intelligent design always begins with a photon and not the electron. 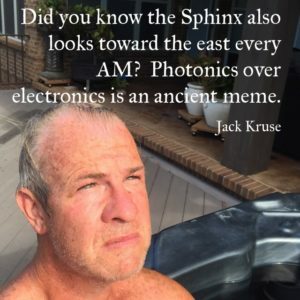 Photonics over electronics is ancient meme and it is about time we understand why nnEMF interupts our carbon based semicondcutors. Here you have the great synthesis of life right before you.